A collection of photos of white sharks (Carcharodon carcharias) shot of Mexico's Isla de Guadalupe biosphere reserve. This is an old shot from 2011 that I've never shared on Flickr. 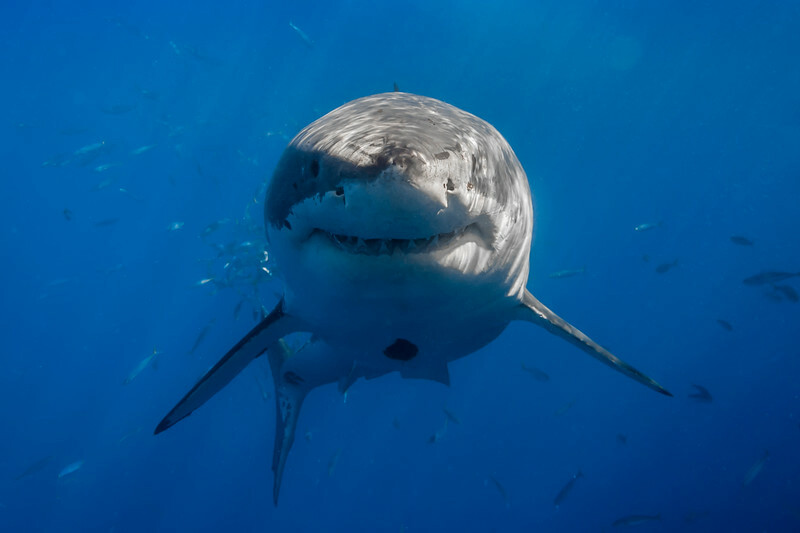 For those of you not familiar with Cal Ripfin (aka Shredder), He was probably the most recognized and "famous" male great white sharks at Guadalupe for years. First identified at the island in 2001, he was consistently spotted every season through 2011. His uniquely injured dorsal fin made him easy to identify, but it was his personality that made him a favorite with divers at the island over the years. He has been missing now for four years and is believed by many to have passed away, due to the consistency with which he visited the island prior to his disappearance. His presence at the island is sorely missed, and it really isn't the same place or experience without him there. I'm grateful for the numerous encounters that I had with Cal and am thankful that I have so many pictures of him to remember him by.